Michele's place was exactly as it was shown, and in fact exceeded our expectations. It was lovely, gorgeous patio, well equipped with many thoughtful extras. W stayed for a week Michele was a wealth of information about the area, and even picked us up at the train station when we arrived, and dropped us off when we left! Michele was a wonderful host. She lives next door and it was helpful to know in case of any problems. ( which there weren't any! ) and she was so helpful, checking in with us, and offering suggestions to make our stay more enjoyable. The property was very close to the supermarket, on the bus route and we used the public transport and local trains so we had no need for a car. We would highly recommend Michele's property and would definitely return. The owner Michelle was wonderful to us. The apartment is very nice, clean and well equipped with kitchen equipment, dishes, pans, towels and all that was needed. We would love to return again next year. Michelle was so kind! Very nice apartment, clean and very well equipped, you will miss nothing! The terrace is fantastic with a beautiful view. The area is very nice and quiet. You can easily reach the center of Nice by bus. The weather was very warm, but no problem as the aircondition in the apartment works very well. The owners are very nice and helpful. Thank you so much Michele and Jean Pierre for letting us stay in your apartment. Hope to see you next year! This apartment is absolutely fantastic- very comfortable- my husband and I enjoyed a lovely week in May 2017. The weather was wonderful and we enjoyed great sight seeing around Nice and also enjoyed very peaceful afternoons sun bathing on the gorgeous private balcony. I cannot express enough how helpful and lovely Michele was. Answering all my queries prior to booking and offering to pick us up at airport on arrival to advice about trains and buses she was a wonderful hostess. 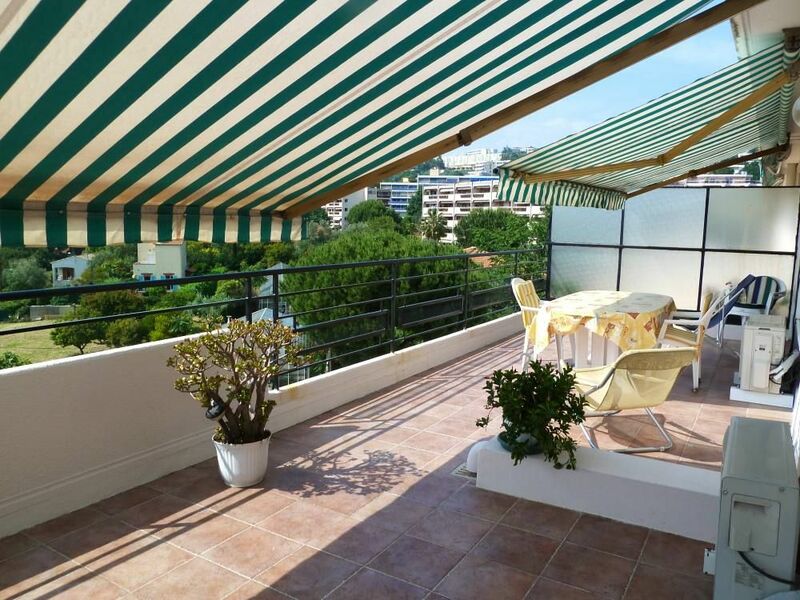 I would not hesitate to recommend this apartment as a base to explore Nice and surrounding areas. It is a little out of Nice city centre but that means a very peaceful holiday. We really enjoyed our stay in Michele's apartment. Both Michele and her husband, Jean-Pierre, could not have been more helpful and hospitable. The apartment was spotlessly clean, well equipped, comfortable and very quiet. There was a very big balcony with a beautiful view overlooking Nice and the surrounding hills. I certainly would not hesitate in recommending this apartment to anyone looking for a holiday in Nice.